The shock! The horror! The surprise! Eh, this turning in both directions thing happens a couple times a year, when NASCAR visits the road courses of Watkins Glen and Sonoma Raceway. I’m here checking out the race, which rules, because road courses are always some of the most fun NASCAR races to watch. Earlier this year, I visited my first NASCAR oval race in person ever, which is an experience that every car person should do at some point. Even if you’re not a huge racing or NASCAR fan, hearing a symphony of bone-shakingly loud V8s magnified by a big oval is a near-religious experience. Now I’m back in more familiar territory for me—a road course—but with these magical stock cars doing their best Aussie Supercar impression over curbs, dips and (gasp!) turns in both directions. 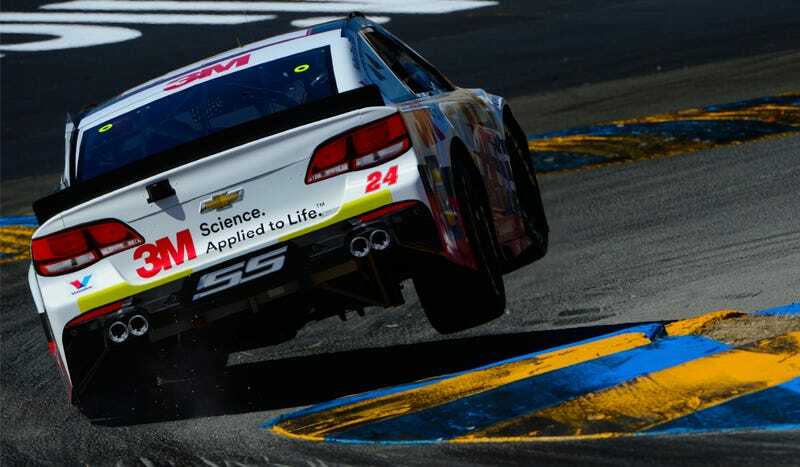 NASCAR on a road course is a lot of fun to watch, with guys like A.J. Allmendinger proving themselves to be somewhat of a modern-day Boris Said. What do you want to see this weekend? Is there anything in particular we should check out? We’ll be taking an up-close look at the cars later to see what all changes from their highly specialized oval racing setup to get these cars to handle turns of varying camber and direction for sure.